By creating a will, you have the power to dictate what happens to your assets after your death. Although contemplating your own demise is never a pleasant experience, proper planning ensures your family and assets are protected when you are no longer around to do the job. If you need to include tax planning information in your will, own a small business or have considerable assets, a simple, no-frills will may not be the most economical choice. If, however, your financial situation is not complex, a simple will is an option. Creating a basic will on your own or with the help of an online legal document provider can also save you hundreds of dollars in attorney fees. Make a list of your major assets, such as real estate, investments, bank accounts and retirement accounts. Add up the value of all of your assets. The total value of your assets determines whether your estate is tax exempt. The federal estate exemption amount changes regularly. As of 2012, the amount is $5.12M. If the total value of your assets does not exceed the exemption amount, proceed with crafting your will. If your assets exceed this amount, a no-frills will may not be adequate to reduce your estate's tax liability. Obtain a will template. Because state laws regarding the information that must be included in a will vary, it's imperative you obtain a will template that follows your state's guidelines. Some states provide these documents to residents free of charge. In California, for example, you can download and print will templates directly from the State Bar of California's website. You can also buy a will template for your state through an online legal document preparation service. Name an executor for your estate. After you die, your executor is responsible for filing an estate proceeding with the probate court, notifying creditors and distributing assets. List each of your assets and indicate who should receive the asset in the event of your death. While most people name immediate family members as the beneficiaries of their estates, consider naming an alternate beneficiary as well. When you die, the executor will distribute your assets to the family members you name. Should your family die together, the executor will distribute the funds to the alternate beneficiary. Name a guardian for your minor children. If you die, the surviving biological parent will generally receive custody of the children. If the surviving biological parent also has died or is unfit, the court must appoint a guardian to raise your children in your stead. If you named a preferred guardian in your will, the court will generally adhere to your wishes. Sign your will. Ask two friends or family members to serve as witnesses. All states dictate that at least two witnesses must be present when you sign the document. Notarize the will if required by your state's law. 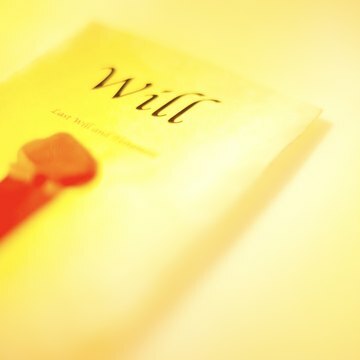 Put the will in a safe place and tell your executor where to find it. Your will cannot protect your wishes if your executor cannot locate the document after your death. Modify your will as the circumstances in your life change to ensure it remains up-to-date and reflects your current wishes.